The shores of the Mediterranean Sea are home to some of Europe’s oldest and most revered settlements, from Spain’s culture-laden second city, Barcelona, to the ancient citadel of Athens, whose skyline is dominated by 5th-century BC landmarks. Among the many castles and forts, palaces and walls, which showcase the depth of history in the great towns and cities of the Mediterranean, there are sacred sites of immense cultural and religious significance. For thousands of years, religion has shaped the cultures, customs and traditions of the Mediterranean, and its influence can still be seen today. Here, we explore seven religious sites you must visit during a cruise of the Mediterranean Sea. Arguably one of Europe’s — nay, the world’s — most famous religious sites, La Sagrada Família is a vast Roman Catholic church which towers high above the quaint, colourful streets of Barcelona, lending its dramatic design to the city’s architecturally-dazzling skyline. La Sagrada is the work of renowned architect Antoni Gaudí, whose opulent Catalan Modernist style can be seen across the city, establishing him as one of Spain’s most celebrated sons. Thanks to its magnificent design, La Sagrada Família is a designated UNESCO World Heritage Site, and one of Spain’s most visited landmarks. The church is impressive both inside and out, so if you’ve time to queue for admission, we’d recommend heading inside to savour the lavish, geometric designs and extraordinary attention to detail. The cities, towns and communes of southern France are littered with ancient religious sites, but none are as blessed with sacred relics as Avignon. Located on the Rhône River a short distance from the mouth of the Mediterranean, this ancient city plays host to one of Europe’s most significant religious sites — the magnificent, enigmatic Palais des Papes. The Palais des Papes, or Pope’s Palace as it’s known in English, housed the papacy of Rome in the 14th century — placing it at the heart of Western Christianity in the Middle Ages. The popes who lived in the palace did so to escape the violent chaos of Rome, and the palace remained under papal control for over 350 years. Today, the Pope’s Palace is one of the most breath-taking historic sites in France, its imposing keep looming over the Avignon skyline and visible for miles around. While it’s difficult to choose just one sacred site to explore in the ancient Greek capital of Athens, one of the most striking has to be the Temple of Hephaestus, whose construction began in 449BC. With its classical architecture and nod to the Greek god of metal working and fire, Hephaestus; the Temple of Hephaestus may seem like any other of Athens’ ancient Greek structures. But, rather uniquely, the temple became a Christian church in the 7th century, and remained in use up until the 19th century. After its final Divine Liturgy was read in February 1833, the Temple of Hephaestus was transformed into a museum of ancient Greek mythology. The site remained a museum until 1934, when it was finally granted ancient monument status and protected for future generations to enjoy. The capital city of the Balearic island of Mallorca, Palma, is steeped in history — from Bellver Castle to the Almudaina Palace. One of the city’s lesser-known, but no less impressive, historic landmarks is the Basilica de Sant Francesc — an imposing sandstone church built at the very heart of this ancient Spanish city. With its Gothic cloisters, landscaped courtyards and delicate interior carvings; the Basilica de Sant Francesc is a peaceful, sacred hideaway in the heart of this bustling city. The exterior sandstone façade of the church was originally constructed in the 13th century, but was remodelled in the 17th century after being struck by lightning. What remains is one of the most beautiful historic buildings on the island, and a great place to visit to get a handle on Palma’s past. If you only have time to explore one religious site during your Mediterranean cruise, it ought to be St Mark’s Basilica in Venice. This is, arguably, one of the world’s most beautiful sacred sites, and one of the best examples of Italo-Byzantine architecture found anywhere on the continent. The cathedral is located in Venice’s pigeon-strewn Piazza San Marco, the so-called ‘drawing room of Europe’, and is an absolute must-see during your visit to the floating city. Despite its age (the cathedral was originally consecrated in the 11th century), St Mark’s Basilica features a number of intricate carvings, mosaics and gold leaf inserts, which give the structure a true sense of opulence. The magnificence of its design became a symbol of Venetian wealth and power throughout the Middle Ages, with many locals coming to refer to the cathedral as Chiesa d’Oro, ‘Church of Gold’ — a tradition which continues to this day. The Blue Mosque of Istanbul is among the most impressive Islamic structures in Europe; a towering structure comprising of palatial domes, spires and lemon groves. In total, this sprawling religious monolith features five main domes, six minarets and eight secondary domes, making it one of Turkey’s most beloved historic sites. Also known as the Sultan Ahmed Mosque after its founder; the Blue Mosque was originally built in the 16th century, with additional domes and spires added in the subsequent centuries. The mosque is located adjacent to the original Hagia Sophia imperial mosque, and borrows from its traditional Islamic style whilst also incorporating elements of Byzantine Christian design. Rome all but sags beneath the weight of its historic treasures, with some of Europe’s most iconic structures — the Colosseum, Pantheon, Roman Forum, Trevi Fountain to name but a few — standing within the limits of the city. 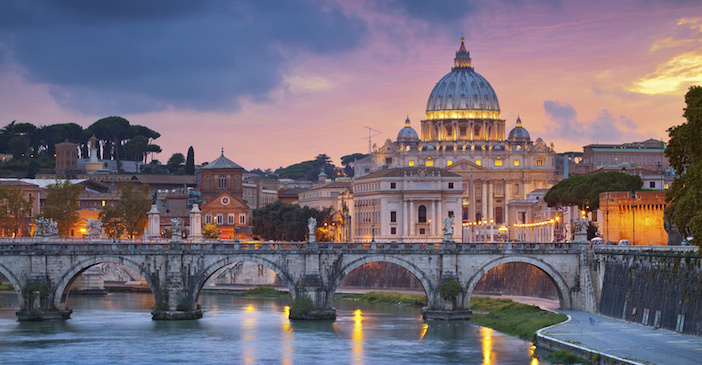 And, as you’d expect from a city which has been at the heart of Western Christianity for around two millennia, Rome also boasts its fair share of stunning churches, cathedrals and sacred religious sites. One of the most significant religious heritage sites in the Italian capital is St Peter’s Basilica, an Italian Renaissance church within the papal enclave of Vatican City. St Peter’s is regarded as the holiest of all Catholic shrines, and the most significant church in all of Christendom. It’s also the largest, with the main dome of St Peter rising to over 135 metres tall. How would you like to explore the historic and religious sites of Europe for yourself during a delightful cruise on the Mediterranean? If that sounds like your idea of the perfect getaway, visit the Cruise1st Australia website for our full selection of deals, or call our friendly sales team on 1300 857 345 to find out more.